Exploring is what makes life fun. With the internet, we can explore the entire world, almost instantly. But wading through page after page of search results is frustrating. This is why we created PLACE FINDER, the smart app that cuts through masses of data so you don’t have to! Find a restaurant, bar, hotel, gas station, shopping mall or any business near you or anywhere in the world in seconds with PLACE FINDER. With access to more than 100 million businesses in over 125 countries and 200+ categories at your fingertips, you will find what you are looking for, every time, everywhere. * iPhone/iPad version coming soon! 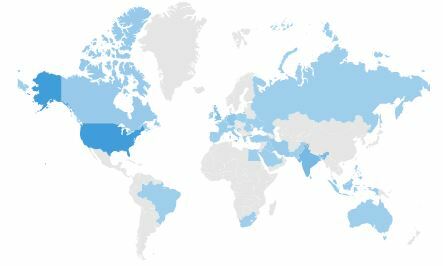 Satisfied PLACE FINDER users around the world! With PLACE FINDER, you are never more than two clicks away from your search results! PLACE FINDER’s searches are strictly location-based and do not favor businesses based on whether they are buying internet ads or on obscure ranking rules. This benefits both app users who get more accurate information and businesses who have an equal opportunity to appear in search results. PLACE FINDER uses an independent, extremely powerful and comprehensive data store. Other similar apps blindly let internet search engines decide how results are returned, which can lend to ranking bias. Whether you are a foodie, busy mom or dad, traveling professional, student, on vacation or moving, explore what’s around you and find the best places before you even make a single step! Using the “Virtual Travel” feature, you can find places in any location without being there (e.g. search for hotels in Boston while you are in LA). Perfect for planning trips or vacations. Also perfect for government or military personnel (Army, Navy, Air Force, Marines, Coast Guard, National Guard) in TDY/TAD or PCS. Searching made simple: Tap, tap and get results! 1 – First tap on a “main search topic”. 2 – Then tap on a category from a short list. 3 – See your results! PLACE FINDER has 16 common-sense main search topics that expand into a comprehensive catalog of 200+ search categories. PLACE FINDER Version 1.1.1 released! Copyright © 2019 //digital things.